At the blast of a whistle, a large assembly of schoolchildren disperses and groups of teenagers begin running in different directions, many of them giggling and all of them holding sticks topped with homemade white flags. The children know where they are going but don’t want to be followed – their purpose is to publicise a normally very private activity. 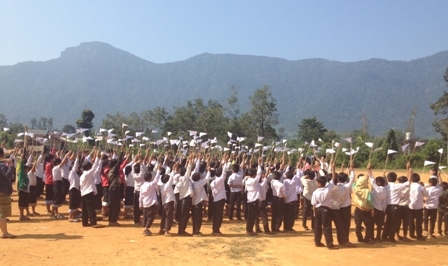 The assembly and flags are part of a Community-Led Total Sanitation drive organised in Ban Nongxong, a village in Bolikhamxay Province in central Laos. Many of the children belong to families that moved to Nongxong in 2009, resettled as part of the Theun-Hinboun Hydropower Expansion Project. As well as providing new houses, land and livelihoods programs, the Theun-Hinboun Power Company (THPC) has installed a clean water supply in the village plus toilets for each house. It also built a school and health centre to contribute towards better health conditions for the residents. However, monitoring of communities by the THPC Public Health Team reveals that two years after moving to their new villages and amenities, many people in Nongxong still suffer from the health problems traditionally common in the Lao countryside: diarrhoea, respiratory diseases and under-nutrition due to both poor diet and parasitical infections. Dialogue with communities shows that despite the new facilities, the villagers’ everyday behaviour often continues to be as it was in the old settlements. Specifically, many people do not use their new toilets, and nor do they use their new water supplies or food production options in a way that will improve their health. 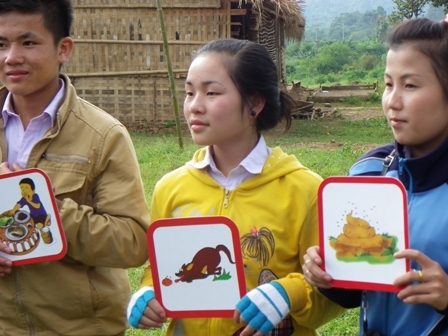 In response THPC has begun pilot programs in Nongxong to help people benefit from the facilities. Cooking classes for mothers have been introduced along with food-growing advice to improve nutrition, while the Community-Led Total Sanitation Initiative launched in partnership with Lao government and non-governmental agencies is helping people adapt to their new surroundings. In M ay 2013 a team comprising staff from THPC, the Participatory Development Training Centre (PADETC) and the National Centre of Environmental Health and Water Supply (Nam Saat) began working with small groups of villagers to explain the consequences of not using the latrines. 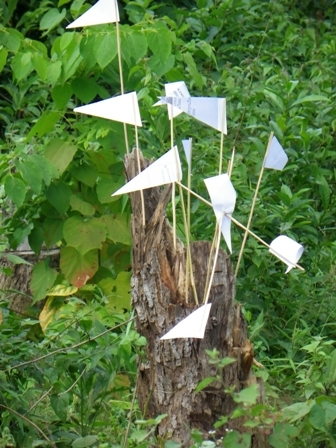 In October, the approach was expanded to include the village school, which is why the children of Nongxong are planting flags around the borders of their playing field. About ten minutes after leaving with their flags the children return to the assembly point. They are still laughing, but are now without the flags, which have been planted in the bushes surrounding the school. 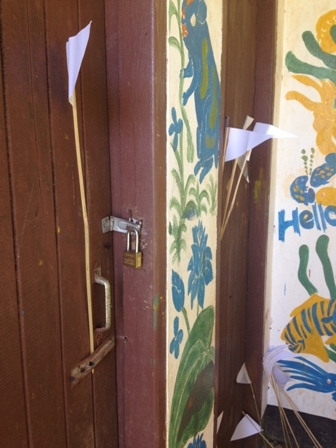 Other flags have been posted around the school toilet block, but there is some confusion about the significance of this: while the toilets appear modern and even pleasantly decorated from the outside, their doors are barred with padlocks and it seems unlikely that the students have used them recently. Locked school latrines are a common problem in Laos. Teachers despair at the poor condition that pupils leave toilets in, and lock them in protest. Children are then forced to defecate and urinate in bushes around the school, a situation that can affect the health of everyone concerned. A teacher at the school, Mr Phatphouthone Manivong, says the children want to use the toilets but do not leave them clean. The teachers organised a cleaning roster, with each class responsible for looking after the toilets for a week at a time, but despite this the condition of the latrines is generally so poor that it is “better to keep them locked”. After the flag activity the children and teachers separate into groups and play connecting games, which graphically show the consequences of poor sanitation habits. It becomes clear to everyone that flies transmit bacteria from human waste to human food, leading to the health problems that are so common in the village. “It’s good that these experts have come here to talk to us today,” says Miss Mee, a thirteen-year old girl at the school. “They have been explaining the connection between food hygiene and going to the toilet in the proper place. This is very important in our village. If we can improve hygiene then we will all be more healthy and able to enjoy better lives”. According to Vongtavanh Muangchanh, Youth Development Officer for PADETC and the team leader for activities at Nongxong, the situation at the school is typical for rural Laos. He says there are three main issues governing the behaviour of the children and the teachers. Firstly, awareness of the importance of using toilets is not high. Secondly, knowledge of how to manage assets such as toilets is low. Finally, there is a lack of institutional instruction on the whole issue. After playing the connect game the children and their teachers return to their classrooms, where question and answer sessions reinforce the messages behind the exercise. Vongtavanh and the team will stay in Nongxong for a whole week, conducting activities with other groups in the village but also following up on the school as a vital institution in the community. After today the teachers understand the importance of the situation and the children’s behaviour a little better, he says. “We will work with the teachers and some student volunteers to create a plan to better manage the toilets. We collect ideas from the pupils about what they think would be a perfect system, and some of these will be practical. In addition we will recommend to parents and the village authorities that they build extra toilets at the school”. Vongchanh explains that this work helps create demand for better access to toilets and that this demand can ensure the supply of a solution. “If you build a facility but the users don’t understand the need for it, it will not work” he says. “The people of Nongxong are now starting to understand the need for community sanitation”. For the THPC team the expertise provided by PADETC and Nam Saat is valuable. “We can link this to community-led sanitation efforts in the village and to our nutrition and livelihoods programs,” says Ms Thepphasone Chanthavong, WASH and Nutrition Senior Officer for THPC. “By improving hygiene and eating habits, we can help people get more advantage from the facilities that the company has provided, and so ensure that their health really improves”.